Sometime you are frustrated with slow Internet browsing speed on your Android phone. If you have bad connection, busy network or wrong mobile settings. But I’ve share few simple tricks from which you can get faster internet browsing speed on your Android phone. This guide is useful for all those guys who are facing this type of situation on his phone. If you have better Wi-Fi or mobile internet but internet moves slowly on your Android phone. There are a lot of reasons behind this problem. It may contribute to your mobile web browser. Now we have to discuss how to get faster internet browsing speed on your Android phone. Lot of Android phone users have to use Google Chrome, Mozila Firefox, Opera or UC web browser in his phone. Let’s have start how to overcome this type of problem. You can also read our previous article how to increase internet speed in Android device. By default most of person have to use Google Chrome web browser in his Android phone. Take following steps to get faster internet browsing speed on your Android phone. Step 1: Tap on the “Google Chrome” on your Android phone. Step 2: Tap on three dot button (Menu) which is placed on the top right corner. Step 3: Tap on the “Settings” option on Google Chrome window. Step 4: Turn on “Data Saver” option. By default “Data Saver” option is turn off on your Android phone. After that Google Chrome will use Google servers to compress pages you visit before downloading them. Note: You can also clear cash memory and history from your Google Chrome browser. If you have “Firefox” web browser then take given steps to get faster internet browsing speed on your Android phone. Step 1: Tap on the “Firefox” on your Android phone. Now, open your favourite web page which you open many time. Step 3: Tap on the Page option on Firefox window. Step 4: Tap on the “Add to home screen” option. Now, a shortcut is placed of your favourite web page at home screen. You have to tap to this shortcut to directly open the favourite web page. 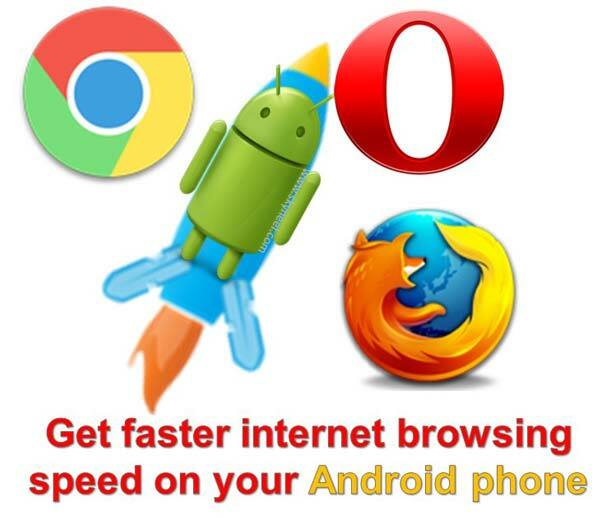 If you have opera mini web browser then take given steps to get faster internet browsing speed on your Android phone. Step 1: Tap on the “Opera Mini” on your Android phone. Step 2: Tap on “O” icon in your Opera mini browsing window. Step 3: Now you’ll get to options “High” and “Extreme”. Tap on the “High” option on Opera browsing window. After turn on this option compress your web pages. Now your Opera web browser speed is much faster than earlier. All these steps allows you to speed up your web browsing software. You have to properly close active web browser when you finished your work. Otherwise web browser running in the background and your mobile data pack is empty. You have to also clear cash and browsing history of running browsing software. It helps you get faster internet browsing speed on your Android phone. If you have any then write us in the comment box. Thanks to all.